In-town, English-inspired Cottage boasts gorgeous gardens, great views of Big Sheepcliff, and charming, all on one level living. 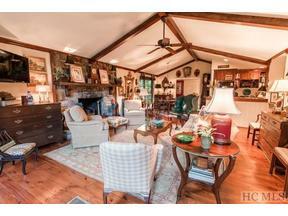 Located in Lancewood, the home is convenient to shopping and restaurants in Cashiers. 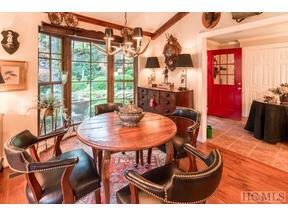 The open plan kitchen and living room feature a stone fireplace and wet bar. The dining room and den feature a wall of windows to enjoy the up-close views of Big Sheepcliff and pleasantly inviting sitting area with fireplace. Wonderful spaces for entertaining, or afternoon tea and a good book. Note the additional fireplace in the cozy master suite. Hardwood floors throughout. Attached garage on the lower level keeps you and your car safe from the elements and there's a potting room or workshop there as well. If you're a gardener, this may be your heaven! Well over 100 boxwoods grace the landscaping, which is the stuff of picture books. Recent home inspection items have been resolved and a new HVAC system installed last year. The home is in move-in condition and ready for the season! Truly unique and one-of-a-kind and must be seen to be appreciated. All this in a walk to town location!